Doraemon (a Japanese manga anime dubbed in Hindi) is blamed for the corruption of our children’s own language as we continue to speak a mish-mash of Urdu, English and our respective regional languages. 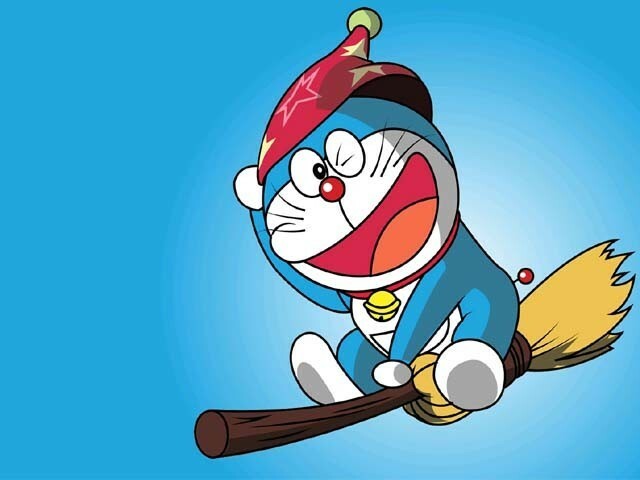 Doraemon has risen as the latest target of criticism. This is the time to honour our culture and language and the well-being of our children. It is heart-warming to see that big-shots in the parliament are concerned about the impact of our TV screens on the youngest of their constituents. However, one of their reasons, along with the ensuing public debates, has revealed the entrenched hypocrisy in us. The hypocrisy lies in our belief that Hindi would/will corrupt our children, yet constantly mixing English with Urdu. It lies in objectifying Hindi as threatening to our language but stereotyping Urdu; for example those who are well-spoken in Urdu must not be fluent in English, similarly, they may be old-fashioned. All stereotypes. Therefore, the real question is whether it is mother tongue versus foreign language, or mother tongue versus Hindi? The Zee TV generation (myself included) and their parents know that the arrival of cheap cable showered us with a variety of content on television. This included opportunities to learn English through Western shows as well as pick up Hindi words from Star Plus. Soon, Urdu was on the backburner as Ainaq Wala Jinn fizzled in thin air and children replaced Urdu words with Hindi in their daily speak. The honest answer is that even without Star Plus, Zee TV and now Doraemon, we have pitted Urdu and our regional languages against foreign languages. Parents complain that children are learning Hindi words from Doraemon. But the cartoon is not the only one to corrupt our language. Even 10 years ago, a student in my Urdu class was shocked to learn that ‘sehmat’ is a Hindi word for ‘ittefaaq’ in Urdu. Now over the same 10 years, parents have started using a combination of English and Urdu with their children in the hopes of developing bilingual skills to ensure academic strength. These are only a few of the dozens of corruptions we make in our language as English words have crept in our daily speak. Even though each of the English words used above have Urdu counterparts, we still include them. The idea here is not to undermine the importance of English or any other language, but to speak one language at a time if it is a so-called ‘corruption’ we fear. I remember that my parents never feared my potential incompetence in the English language (which is already so actively taught in our schools now) but rather stressed upon me speaking pure and proper Urdu or English – one at a time. It did not make me any weaker in English; rather it gave me strength and confidence to excel in both languages at school and otherwise. This does not compromise their language, English. Neither does it compromise the one they are adopting. The second hurdle we face in this linguistic crisis is the typifying of those who prefer Urdu or a regional language over English. We demean Urdu and regional languages as much as we demean Hindi, leaving us in this hypocritical state, so-much-so that excelling in them becomes a reason for judgmental reactions and stereotypes. I, too, have been a target of this criticism, especially for my decision to pursue Urdu at a higher level (even after ‘O’ levels) instead of foreign languages. Why does being good at Urdu reflect weakness? Why does excelling in English showcase strength? It is this inferiority complex and consciousness of our own language that allows even animated characters like Doraemon and Nobita and Indian vamps on TV to take over our children’s tongue. Doraemon is certainly not worth watching for the values it imparts – but to rest the fall of our language on it is unfair and unrealistic. It is our own failure to decide what our children should learn to speak first. And, by not confidently speaking our own language with them throughout, we have allowed this corruption. Be it Urdu, Sindhi, Punjabi, Pashto or any other language we speak, we must speak it in its pure form and then expect our children to learn it. The same goes for English or any other foreign language. Policies of the GHQ for you. They speak Punjabi all the time but do not give it the respect of a national language. Unfortunately, Punjabis in Pakistan are the only ethnic group of people who hate their mother tongue. Urdu cannot be the language that unites the people of Pakistan. It is the mother tongue of 13% of Pakistan. Watching Doraemon (and that too in Hindi!) is still way safer than the ‘knowledge’ they gain in their nearby mullah-infested Lal Masjids of Pakistan. pehen, rakh, kahan all are HIndu words and so do beta, lo, hai, pe, yeh and do. URDU is 99% Hindu, Sanskrit and Prakrit. Urdu is a subset of Hindi. I’m a Pakistani ( a logical one ) and I’m here to tell you that nothing is wrong with Hindi , English , or any other language in the world , if they said it as ” it was against Islam ” ( many other people say that too) they should know that no language is bad in Islam , is it the fault of the American Muslims that they were born their and they speak English ? Or even the Indian Muslims ? To be fair , in Islam even Urdu is nowhere , does that make it a bad language too? The topic and hand is corruption of Urdu Language.. and she is rightly talking about corruption of Urdu language in pakistan by highlighting how it is taking place with English too but no body talks about it because English isn’t Indian.. Anything Indian can be riled up in Pakistan including language.. Funny thing is that Urdu is ALSO an Indian language… that pakistan borrowed as a national language..
English does not have “respectful you.” Aap. Their Sir is also derivative of Sanskrit Sri and Sriman. You promoted your culture which made natives lose their native culture and language. Result is in front of you. Convent educated rich kids in Pakistan are killing bus load of Ismailis just like their Taliban & ISIS brothers. Till you had some HinduSikhs, Pakistan was sane, now with native roots gone, Pakistan is breeding terror. The Iran outsourced Islamic origin language Hindi is first of all not the heritage language of India. Pakistani language Hindi blabbering Muslim Prime Minister’s goal along with the Islamic parties BJP and Khangress are to make the whole country the enemy country Pakistani language speakers. Hindi and Urdu are the same language which are both Islamic origin and outsourced from Iran. Sanskrit script does not make the Islamic origin language Hindi into an Indian language. Muslim Prime Minister Narendra Modi is forbidden to speak Indian languages as his religion Islam does not allow to make friends with “infidels” which are Indian language speakers. Islam also commands creeping sharia and gradual conversion to Islam, in this light Indian language speakers need to be converted into Islamic origin language Hindi speakers before the Hindi terrorists from Pakistan can access the country to finish of the infidels. Islamic origin language Hindi has NOTHING TO DO WITH HINDUISM. english is not an annoying profanity infested language like Hindi. Hindi just sounds like a bad blend of tv noise and insect noises. Cant stand it. Hindi originates from Sanskrit. The script too is Devnagari. Urdu too originated in India and is a mixture of Hindi and Farsi. However the grammar is entirely based on Hindi grammar using language rules provided by Panini the grammarian. Unsure where you came up with the idea that Narendra Modi is Muslim. Are you saying that Gujarati – his mother tongue is also an Islamic language? Sanskrit predates everything your new Abbu, Macaulay might be teaching. Macaulay Abbu cannot go before 1500 years before Roman fake Jesus happened because the Roman slave manual / Bible does not allow it. Thi is a root which means state which is in change. Thiru means stable. Roop itself comes from Tamil , uruvam. Word inversion from Tamil to Sanskrit is present in other words – seer / Rishi (Sanskrit), seer also mean uniform/ in order. If we considered human as evolved from animals, the progression of sound would be from simple sound to complex. Sanskrit has a large sophisticated set of letter Ka, Kha, Ga, Gha which is advanced development of speech. Tamil only has a quarter the sounds and only simple sounds. K/G; T/D, P/B are all the same letter, the initial words in original Tamil only start with K, G, P. But there also been circular influence with Sanskrit. Word components in Sanskrit words have Tamil roots, bhaagam which is Sanksrit words for “part” has Tamil root verb paagu to divide, but due to Sanskrit influence, the B sound is also used. Central government is hell bent on breaking the country. They have sold several territories to the neighbouring countries. The Southern Island Katchaitheevu, a Hindu temple gate in Manipur to Burma, several villages to Bangladesh.